Diamond Jubilee. 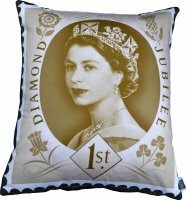 I may have to admit to a slight obsession with Jubilee-related merchandise, and so I can’t help but pick this beauty of a cushion this week in celebration – The Royal Mail £1 cushion from The Colour Union. I love this tribute to a Royal Mail classic, I love the colour, I love the fact it’s a sumptuous velvet. It’s not cheap at £79, but we’ve had some pocket-friendly cushions for the last few weeks so I figured I could treat myself to this one. It is the Jubilee after all. 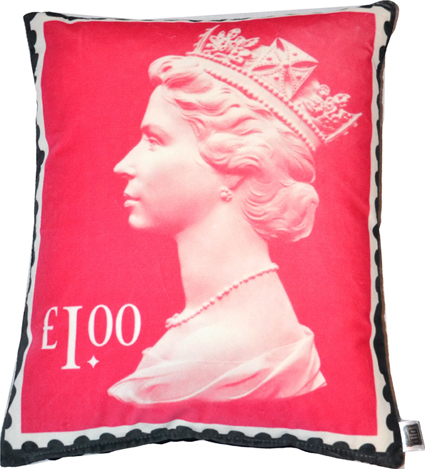 And while I’m donning my red, white and blue, waving my flag madly, and enjoying my first ever street party, I’m going to go all-out and include a bonus cushion this week – the Rule Britannia Diamond Jubilee cushion, £70, The Colour Union.